Like every other room in your home, feng shui in the bathroom has its own set of unique rules. However, unlike other rooms, good bathroom feng shui is particularly challenging and can be really hard to achieve. Still, there are great solutions that can allow you to achieve a cleansing space and bring good fortune to your mind, body and soul. To help you along the way, here is how to create good feng shui in your bathroom and improve its natural energy flow. For the most part, bathrooms are dedicated to water, and the cleansing of your body and the renewal of your spirit. However, with water being the predominant element in all bathrooms, you will need to look towards color to balance out the energy flow. Never choose water colors, like black and blue, and instead choose a more metal associated color like white, or light skin colors that are friendly to your body. In turn, this will create balance among all the five elements, and create harmony in the bathroom. If you have a choice when deciding on the bathroom’s position in your home, you should consult the bagua. Bagua is a feng shui energy map that helps you arrange your rooms to get the maximum amount of energy flow in your entire living space. Depending on your home, you should never make your bathroom face the front door, as this allows good energy to leave your house. Instead, your bathroom should connected to the bedroom and kitchen, if possible, so to create harmony among the most important aspects to your body. Mirrors are an important aspect of good bathroom feng shui, as they increase the circulation of energy. Still, bathrooms also contain dirty energy, so it is important that you mirror doesn’t reflect the toilet. If you have a large mirror at your bathroom vanity area, and you can see yourself while sitting on the toilet, remove the mirror. Try moving it to a different location, or use a portable mirror that can be re-positioned. A major issue when creating quality feng shui in any room is cleanliness. 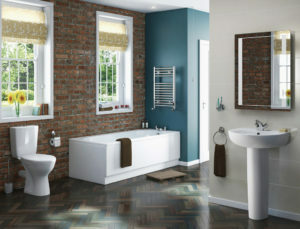 Bathrooms are the epitome of your body’s need to stay clean, and the space should reflect that. Keep your bathroom clean by containing your bathroom supplies in the vanity cabinet. This will de-clutter the bathroom, so you have more room for scented candles, essential oils and artwork, which give bathrooms a more soothing atmosphere. Also, always keep your bathroom window clean, in order to invite sunlight and the sun’s energy in. Water flow in feng shui is also connected to money and income. Since water is constantly escaping down the drain, this can be a major problem in bathroom feng shui. To maximize favorable energy you should always keep the bathroom door closed, as well as the toilet lid, and even the shower door. This will stop the good energy in your other rooms from escaping. Ask your local plumbers for help and separate your toilet from your bathroom. That will keep the bad energy associated to bathrooms confined to a single space. Lastly, add crystals and plants to your bathroom. Crystals are considered feng shui energy enhancers, and can direct the chi in the bathroom to move up, rather than down the drain. Plants, on the other hand, add more green and wood colors to your bathroom and balance out the water element. Together, crystals and vibrant plants improve energy and create harmonious feng shui. Following these simple steps will improve the energy flow in your bathroom, so it works in your favor. Keeping your body and spirit clean is an existential necessity, so use these simple steps to create a place of harmony and balance and receive the most out of your bathroom every day. However, unlike other rooms, good bathroom feng shui is particularly challenging and can be really hard to achieve. 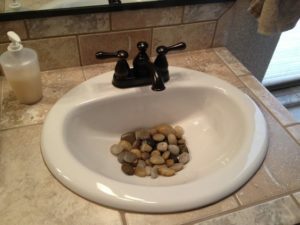 This entry was posted in Home Improvement and tagged Bathroom, Bathroom Feng Shui, Bathroom Ideas, Easy Feng Shui tips, Feng Shui, Feng Shui Bathroom, Feng Shui Bathroom Tips, Feng Shui in the Bathroom, Feng Shui Tips. Bookmark the permalink.